Photo: Hardin Towell and Lucifer V.
New York, NY – September 21, 2017 – The second day of the 2017 Rolex Central Park Horse Show (RCPHS) featured international and national show jumping competition, showcasing top equestrians from around the world on Thursday, September 21, in the heart of New York City’s Wollman Rink. The evening was presented by CSX, highlighting the $40,000 U.S. Open CSX FEI Speed Class, which saw a win for Hardin Towell (USA) and Lucifer V, as they opened elite show jumping competition for the week. The evening’s competition also featured the U.S. Open $50,000 Spy Coast Farm Puissance, which saw Emanuel Andrade (VEN), Kama Godek (USA), and Todd Minikus (USA) split the victory three ways after each cleared the traditional brick wall at a height of 6’9″ inches. The $5,000 1.20m Junior/Amateur Jumper Speed Class was topped by Mimi Gochman of New York, NY aboard Gochman Sport Horse LLC’s entry, Avoloma BH. Guilherme Jorge (BRA), course designer of the 2016 Rolex Central Park Horse Show and 2016 Olympic Games in Rio de Janeiro, returns to Wollman Rink as the show jumping course designer for this week’s national and international competition. The U.S. Open $40,000 CSX FEI Speed Class saw 30 horse and rider combinations take to Wollman Rink for their first night of competition, including some of the world’s very best, highlighting rounds by Kent Farrington (USA), and McLain Ward (USA), alongside rising talent Lucy Deslauriers (USA), who finished in a competitive fifth place. The winner of the U.S. Open $40,000 CSX FEI Speed Class, Hardin Towell (USA), guided Evergate Stables’ Lucifer V, a 2006 Westphalian gelding (Lord Pezi x Grandina), improving upon the pair’s third place finish last year and crossing through the timers in 53.53 seconds. Towell was the last entry on course and ultimately overtook Daniel Bluman (ISR) aboard Bacara D’Archonfosse, a 2007 Belgian Warmblood mare (Asca Z x Queen D’Archonfosse) owned by Kim Douglas and Alexa Schwitzer, who stopped the clocks in 55.75 seconds. Kristen Vanderveen (USA) and Bull Run’s Faustino De Tili, a 2005 Belgian Warmblood stallion (Berlin x Bijous Van De Vijfheide) owned by Bull Run Jumpers Five LLC, rounded out the competition in third place, finishing in 55.98, adding four faults to their converted time. Towell and Lucifer V have been partnered together for several year and amassed top finishes around the globe in international competition. The pair has excelled during the summer season and Towell felt that the size and structure of the ring helped the duo secure the win and spoke to the versatility of Lucifer V.
Bluman is also coming off of a very successful European tour, like his friend Hardin Towell, and was pleased with Bacara D’Archonfosse and her performance, as they look towards the $216,000 Grand Prix CSI 3* presented by Rolex. Kristen Vanderveen and Bull Run’s Faustino De Tili were incredibly close to stealing the win in Wollman Rink and used the tight course to their advantage, posting the third fastest time despite knocking the first rail at the one-stride combination. The evening’s competition concluded with the U.S. Open $50,000 Spy Coast Farm Puissance, which saw a three-way tie between Emanuel Andrade (VEN) aboard Clouwni, a 2003 Holsteiner gelding (Colman x Odessa XVII) owned by Andrade, Kama Godek (USA) and her own De Grande, a 2008 Dutch Warmblood gelding (Verdi x Concorde), and Todd Minikus (USA) piloting VDL Excel, a 2009 Dutch Warmblood gelding by Douglas and owned by Autumn View Farm. The class boasted five entries that began the competition at a wall height of 5’3″. All five entries contested a height of 6’9″, before Andrew Kocher (USA), and Paul O’Shea (IRL) were eliminated in the fourth and final round of competition. Emanuel Andrade, a notable name on both the national and international show jumping circuits, contested his first Puissance class under the lights aboard his own Clouwni, ultimately clearing the massive wall set at 6’9″. Veteran of the group, Todd Minikus, guided a young talent in his string in the class, also clearing the impressive wall at its top height. 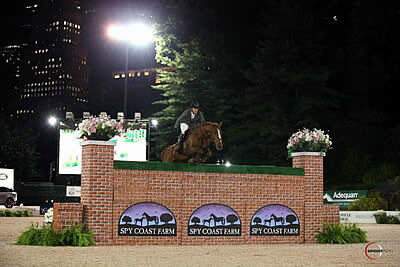 At only eight-years-old, VDL Excel looks to be a strong contender for the future and Minikus commented on the experience for both horse and rider under the lights in Central Park, while thanking class sponsor Spy Coast Farm for the opportunity. The revival of the Puissance in New York City was sparked by the once popular National Horse Show hosted at Madison Square Garden for many years. Mark Bellissimo, CEO of International Equestrian Group (IEG), felt it was necessary to keep the tradition alive in Central Park, once again bringing the entertaining brick wall back to the iconic city. Spy Coast Farm, a sport horse breeding and training operation based in both Lexington, KY, and Wellington, FL, was a first year sponsor of the U.S. Open $50,000 Puissance class and Lisa Lourie of Spy Coast Farm was on hand to discuss their participation in the event this year and discuss her love for Puissance, which was sparked by watching the entertaining class at the Dublin Horse Show each summer. The night commenced with the $5,000 1.20m Junior/Amateur Speed Class, which awarded a victory for New York City’s own Mimi Gochman, piloting her new mount, Avoloma BH, a 2005 Dutch Warmblood mare (Quasimodo Z x Voloma) owned by Gochman Sport Horse LLC. Gochman completed the track in 52.97 seconds, almost three full seconds ahead of the second position finisher, Alexandra Crown, also of New York, NY, who rode her own Quentucky Jolly, a 2004 Selle Francais gelding (Nirvan V x Fabiola Depinette), to second place on 55.82 seconds. The class continued with an impressive New York native streak as Sophie Gochman took the third place slot aboard Wirina, a 2003 Dutch Warmblood mare (Harlem x Sarina) also owned by Gochman Sport Horse LLC, after finishing the course in 55.87 seconds. For more information, visit www.centralparkhorseshow.com. Kama Godek and Air Force One. Wellington, FL – January 9, 2014 – Kama Godek and Air Force One soared through the jump off in the first event of the Wellington Turf Tour on Wednesday, January 8, 2014. Their finesse through the short track allowed them to surpass 17 contenders in a solid 36 seconds. Their time proved untouchable as each consecutive rider attempted to catch their pace, but Godek’s strong turns and quick pace made it an impossible feat. Godek is no stranger to The Ridge at Wellington’s Turf Tour. Although this is only the second year that Godek has traveled to Wellington for the winter circuit, she has made the Ridge events a permanent fixture on her show schedule. Last year, Godek navigated Air Force One to several top placings in the event, and she returned to take charge for the 2014 series. Air Force One proved to be in peak condition as Godek navigated the grey gelding through Pierre Jolicouer’s course. Godek had seen Kevin Babington take the lead only minutes before aboard Shorapur, owned by Shorapur LLC, but Air Force One covered the ground with a quick pace and was right there for Godek as they sliced the turns and beat Babington’s time by a narrow margin of a little over a tenth of a second. Babington secured the second place aboard Shorapur, while also snatching the third place with the 10-year-old mare Baloucat. 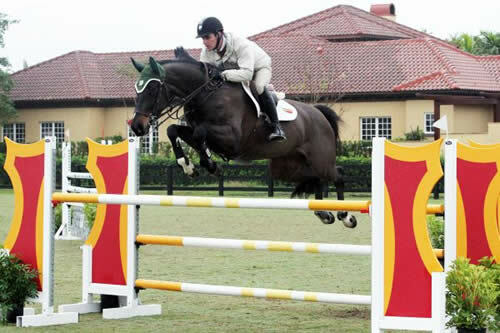 The Ridge events are nostalgic for Babington since he rode Shorapur for the first time during the first event of the Wellington Invitational Series in 2013. Such positive reviews were heard from other top riders throughout the course of the day, including Chris Kappler, who brought two of his students to compete in the two classes. It was Schuyler Riley, the host of this week’s event, who rode to the victory in the second class of the day. She entered into a three-horse jump off to ride away with the win aboard Navalo De Poheton, owned by Wolfstone Stables & Sales. She jumped to a double clear effort in 33.150 seconds. Godek secured the second place aboard Air Force One with another clean jump off in 33.274 seconds. Liz Mahoney and Carpe Diem rode to the third place with a four-fault jump off round in 48.975 seconds. Not only was the competition fierce for the opening day of the Wellington Turf Tour, but the hospitality was unparalleled. The Ridge at Wellington hosted a beautiful spread for breakfast and lunch, allowing riders, owners and trainers to take a moment to relax in the tranquil atmosphere. The course opened at 8 a.m. and remained open until 4:30 p.m., allowing competitors ample time to come at their convenience to ride and enjoy the ambiance of Wolfstone Stables. The $175,000 1.40m Invitational Grand Prix event will return to Wolfstone Stables tomorrow for the first week of competition, and will then make its way to the International Polo Club Palm Beach for Week Two of the Wellington Turf Tour. The 10-week series will culminate with the $24,750 Wellington Turf Tour Invitational Grand Prix Finale on Saturday, March 22, 2014. Riders have the opportunity to ride over straight from the show grounds, or trailer their horses over while enjoying unparalleled hospitality and quality competition. The Ridge series is the perfect training opportunity to help riders and horses prepare for the classes held at the Winter Equestrian Festival, helping to end the daily grind and prevent complacency throughout the circuit. Meadowbrook Horse Transport will provide transportation to and from the horse show and other locations throughout Wellington for both the Wednesday and Friday events. The transportation is a nominal fee of $50 per horse, and will be calculated into the final show fees. To make a reservation for one of the three pickup times: 8 a.m., 11 a.m. and 2 p.m. please call Peter Tufano of Meadowbrook Horse Transport at (954) 415-7217, or call Nona Garson at (908) 500-0996. For more information about the Ridge at Wellington, please go to http://www.theridgefarm.com. For up-to-date information, please follow the Ridge at Wellington on Facebook at http://www.facebook.com/pages/The-Ridge-at-Wellington/219358376264. The Ridge at Wellington Turf Tour offers their popular 1.40m Invitational Grand Prix for its second year, with an open in gate format taking place once a week at beautiful venues throughout Wellington. The Ridge at Wellington Grand Prix Finale will take place March 22, 2014. The Turf Tour also will host 1.30m-1.35m Jumpers every Wednesday beginning January 8, 2014 and running until March 19, 2014. Young Jumper Classes and both Children’s/Senior Jumper Classics will find their home intermittently throughout the Wellington Turf Tour. The Ridge at Wellington offers Equitation Shows every Tuesday of the month from January – March 2013. There will also be a series of schooling shows at the Ridge at Wellington for all experience levels. Two USHJA International Hunter Derbies will take place February 7, 2014 and March 21, 2014. The Ridge at Wellington series includes several weeks of competition throughout the Winter Season with USEF Rated Equitation Shows. This winter will also feature five two-day schooling shows. The Ridge at Wellington Turf Tour will offer 1.30m-1.35m Jumpers, 1.40m Invitational Grand Prix, Young Jumpers, Children’s/Senior Classics, and two hunter derbies. Wednesday, January 8, 2014 – 8 a.m. – 4:30 p.m.
Friday, January 10, 2014 – 8 a.m. – 4:30 p.m.
From the Florida Turnpike: Take the exit for LakeWorth Road West. Continue on Lake Worth Road approximately 6 miles to South Shore Blvd. Make a left on South Shore Blvd. Continue to the stop sign at 50th Street. Make a Right on 50th Street. Continue to Stables Way and make a right. Continue to the end of Stables Way and make a right on Palm Beach Point Blvd. Driveway to farm is 50 feet on the left. From Route 95: Take the exit for Forest Hill Blvd West. Continue on Forest Hill Blvd to South Shore Blvd. Make a left on South Shore Blvd. Once on South Shore Blvd, continue straight at light at Pierson Road and again straight through the intersection at Lake Worth Road, to the stop sign at 50th Street. Make a Right on 50th Street. Continue to Stables Way and make a right. Continue to the end of Stables Way and make a right on Palm Beach Point Blvd. Driveway to farm is 50 feet on the left.